Rainy and I have started our therapy cat visits! We alternate between two senior residences, for about an hour each Friday morning. My tote bag is always packed beforehand and ready with treats, toys, blankets, sanitary pet wipes, and camera. The morning of a visit I clip Rainy’s nails and brush a dry shampoo through her coat. When it’s time to head out, I put Rainy’s harness on her and load her into a crate. After we arrive at our destination, I load Rainy into her pet stroller. Then we spend an adventurous morning visiting seniors. Rainy and I began our visits to one senior residence back in mid-January. Each time, we pick who to visit and how long to stay. We’ve gone four times, and Rainy has continued to improve. On our first visit, Rainy started out shy but eventually relaxed. When I took Rainy to meet one of the activity directors, Rainy immediately hid under an office desk. Shaundra and I ignored her while we carried on our business. I handed Rainy’s medical records to Shaundra and swapped cat stories. 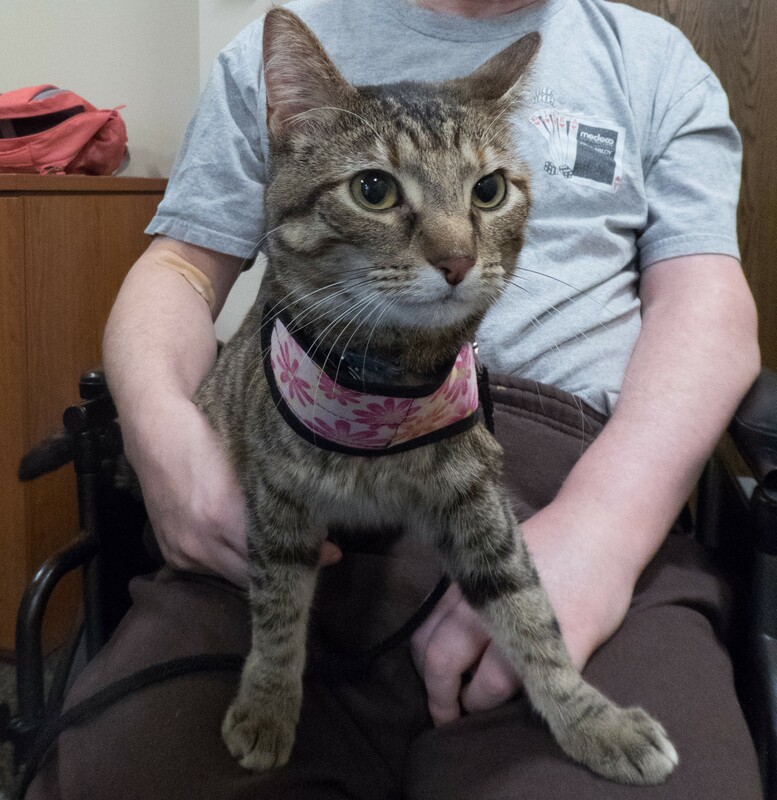 Then Shaundra explained that the cat therapy program would mirror the dog therapy program: The apartment of each resident participating in the therapy dog program has a dog magnet at the top of its doorway. 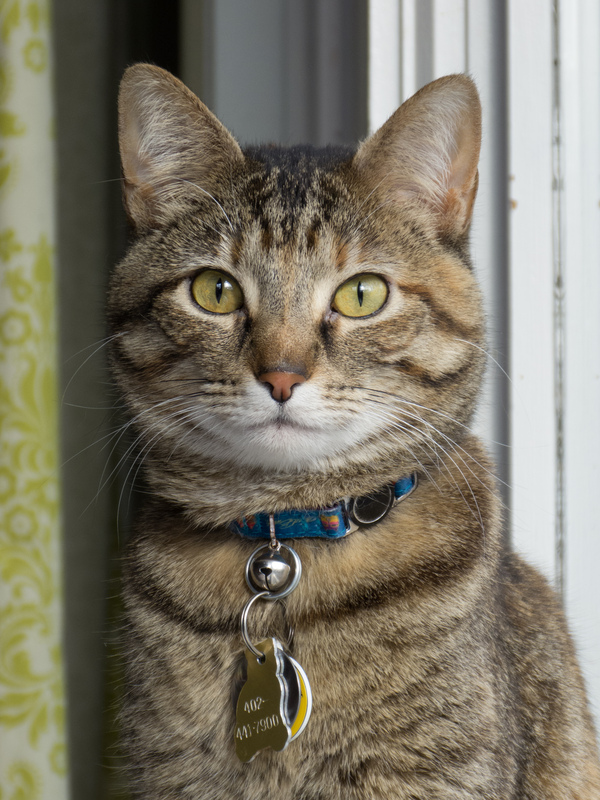 Naturally, cat magnets will now be used to signal which residents would like a visit from Rainy. After we finished deciding the details of our visits, Shaundra gave us a tour of the facility. At one point we paused to visit a cat-loving resident. By this point, Rainy felt comfortable enough to greet people and be petted. A successful start! Shaundra encouraged us to not rush our progress. For that reason, we made only one stop on our second visit, and it was to the cat-loving resident that we had met previously. At first Rainy just stayed in her stroller while Jan and I chatted. Jan asked Rainy’s name and her age. She also shared some of her life story with me. During a lull in our conversation, I gave Jan treats to entice Rainy out of her stroller and into a chair. Rainy soon relaxed enough that she agreed to perform some tricks. Then she wanted a break and so I took her for a walk on leash in the hallway. When we returned to Jan’s room, Rainy allowed me to place her on Jan’s lap and for Jan to pet her. It was on our third visit that Rainy showed how comfortable she had become with Jan. Upon entering Jan’s room, Rainy jumped out of her stroller, flopped onto the floor, and rolled her scent into the carpet and onto Jan’s feet. Then while Jan and I chatted, Rainy lay on a nearby chair and ate treats from Jan’s hands. At the end of our visit, I took photos of the two. Our fourth visit did not go as smoothly. Rainy’s comfort level fell when I challenged her by taking her to visit additional residents. Our first stop was a quick one. We started with a lady who had just returned from breakfast and was bundling herself in blankets. She smiled at us and I exchanged some stories with her, but then she drifted off to sleep. The next stop lasted longer. The lady smiled and bubbled with conversation. She used to own a cat and wanted to know everything about Rainy. Despite the allure of treats, Rainy mostly stayed near me. Our last stop was to see Jan. Rainy snuggled with her while I share photos, but then Rainy hopped into her stroller and turned her back to us. Enough excitement for one day! 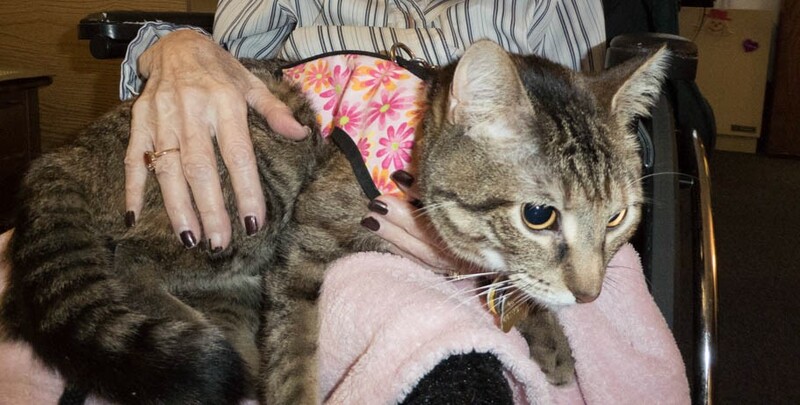 Rainy and I began our visits to the second senior residence in early February. Those interested in meeting Rainy sign up for a 15-minute time slot, and the visits take place in a common room. We’ve gone three times, with mixed results. Two weeks later, Rainy and I returned. During the first time slot, Rainy again mostly explored the room. After that, in contrast to our previous visit, Rainy remained restless. Her ears perked and her tail twitched at every little sound from the hall or parking lot. Her attention was clearly elsewhere. She even refused to sit with two of the residents. 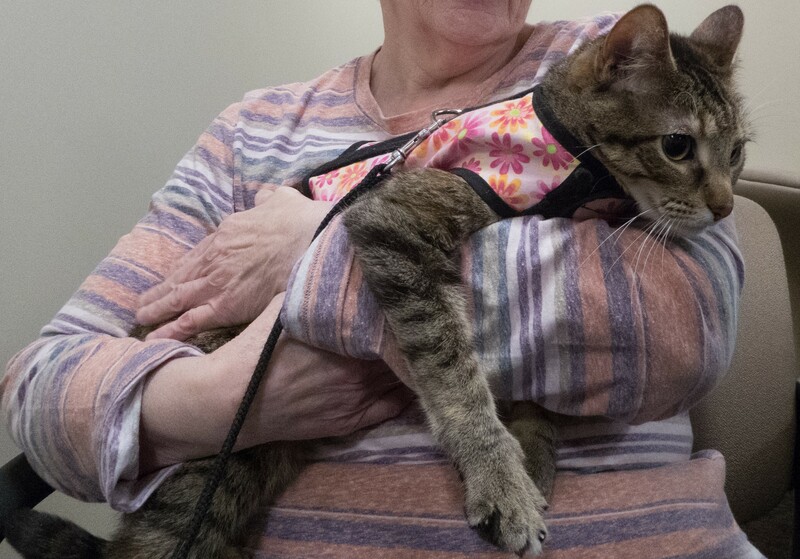 I left feeling as if the visit had been a disaster, and even questioned whether I was making the right choice in asking Rainy to be a therapy cat. As soon as we got home, I posted my concerns to I-CAT. One member reassured me that it might simply be an issue of maturity. Rainy isn’t even three years old and so is still a “child.” Another member pointed out that it could simply be an issue of experience. 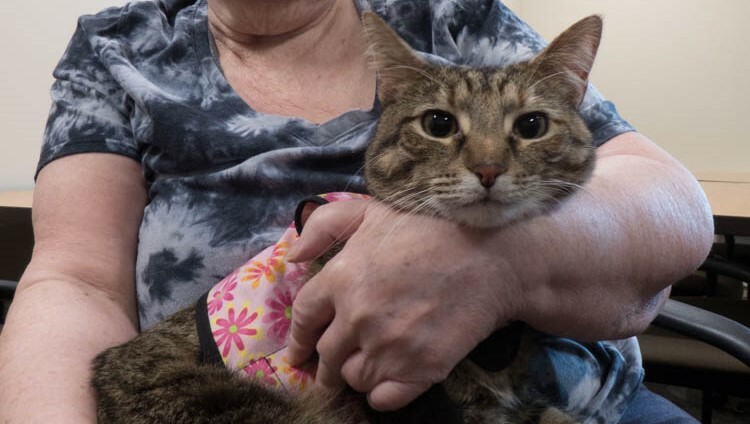 Rainy has only been a therapy cat for two months! Several members recommended that I proceed more slowly with Rainy and to not push Rainy to sit in people’s laps. 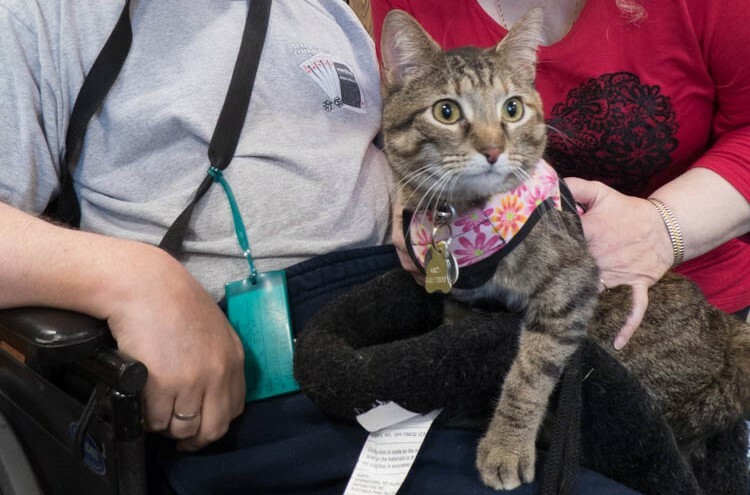 They advised that most residents will be happy simply to pet Rainy, and they suggested that I allow her to stay in her stroller or that I put her in a basket or on a chair. They also encouraged me to take more of a leadership role during our visits. If I’m nervous Rainy will pick up on those feelings. In addition, if I want Rainy to stay close to me, or if I want residents to let Rainy make the choice to sit with them, then I need to communicate this clearly through my words and actions. Members also agreed that I should reduce our outings from 90 minutes to 60, the latter being the average length of therapy pet visits. To my relief, our most recent visit was a positive one. On our way to the senior residence, I took Rainy to the pet store. I did this so Rainy will associate car rides with all kinds of outings. 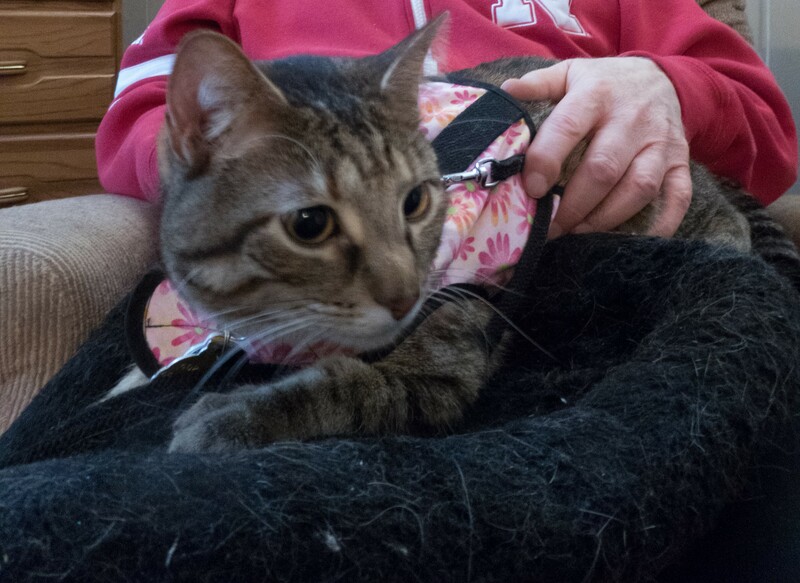 Then when I set up in the senior center’s common room, I gave Rainy several options of places to lay: her stroller, a bed on the table, and a basket next to the resident. I also loaded up her basket with toys. I did these things to maximize her comfort. The next part of my strategy was to provide each visitor with a dish of treats so that Rainy would view strangers positively. Finally, because Rainy had shrunk back from a man in a wheelchair during our last visit, I initially held Rainy to reassure her but then gave the man a tube of squeezable food. As soon as Rainy smelled it she sniffed his hands and purred. Finally, I explained to each resident that we would respect Rainy’s choice of where to be, whether it was on their lap, in her stroller, or elsewhere. Being curious, Rainy ultimately did explore the table, basket, and even the laps of residents. 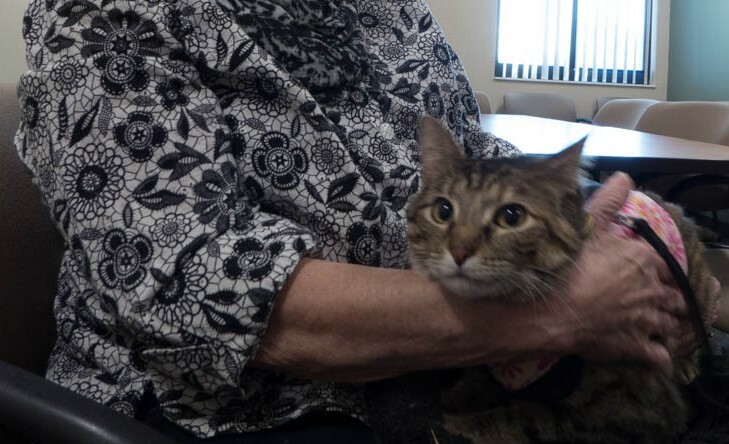 When she got into people’s laps, I praised her and stayed attuned to her reactions. At the first sign that she felt discomfort, I offered her a break. During that time, I invited her to do tricks with me or simply let her chill out in her stroller. About nine months ago, I decided to post timely updates about my training with Rainy. I knew this was a risk. We were inevitably going to make mistakes and those less-than-successful moments would be in print for anyone to read. But I also believed that sharing our ups and downs, and what we learned from them, would benefit others. Some might learn from our mistakes, while others might take comfort in knowing that pet training doesn’t require perfection. Stay tuned for future updates and email me at allisontalkspetsATgmailDOTcom if pet therapy interests you. Clicker training has been around for over half century. B.F. Skinner discovered its underlying principles in the 1940’s and used a clicker publicly as a marker with a dog in the 1950’s. Within ten years, dolphin trainers began to use whistles for the same purpose, that of cuing animals with sound to perform desired behaviors. In the 1970s, clicker training gained popularity with pet owners, when animal trainers Karen Pryor and Gary Wilkes started giving clicker training seminars to dog owners. After that, in 1998, Alexandra Kurland published Clicker Training for Your Horse. This text led to the publication of training books for other companion animals including cats. 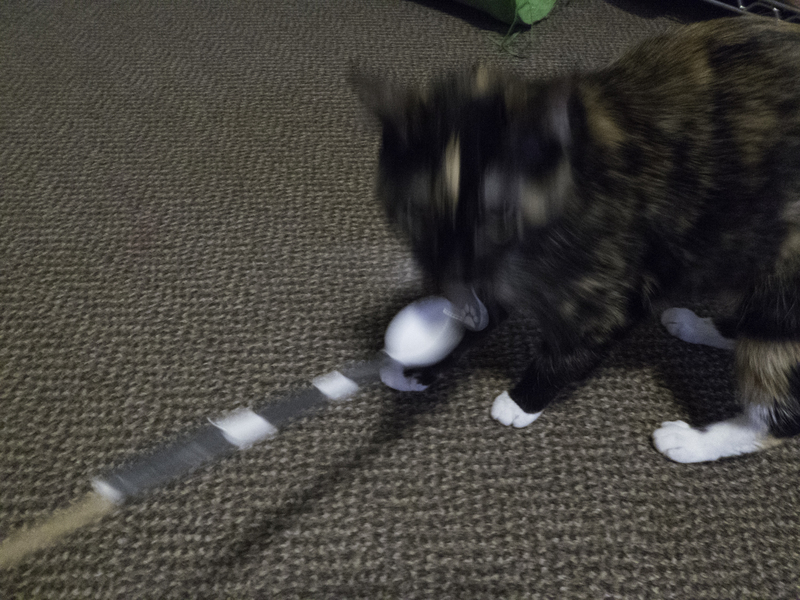 What follows are the highlights of my attempts to teach our three cats clicker training, a feat that has perhaps educated me as much or more than it has them. Show the cats the target stick. Click and treat the instant my cats looked at the target stick. Click and treat the instant my cats touched the target stick. 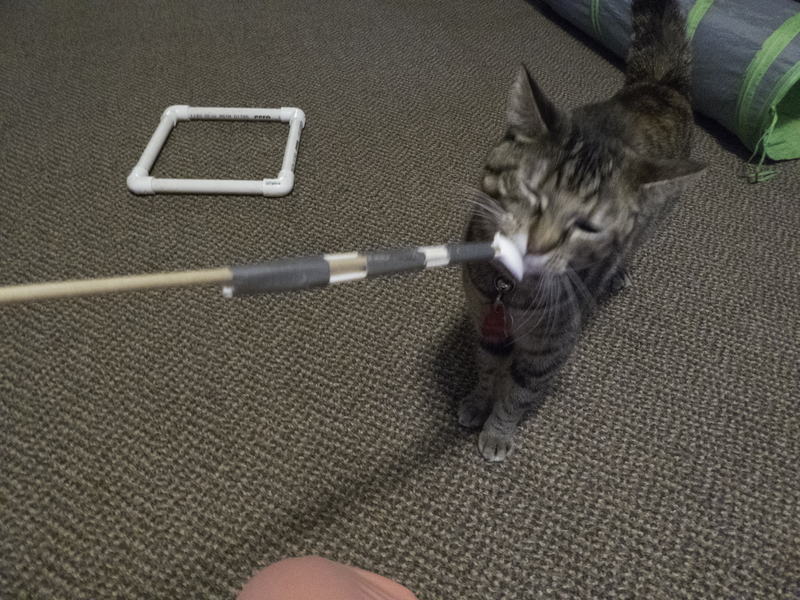 Two of our cats immediately figured out that looking at and later touching the target stick earned them treats. Our third cat wanted nothing to do with the target; instead she tried to figure out where I had placed the treats, so that she could go straight for the prize. As for me, I struggled with two challenges. First, trying to retrieve meat with the same hand that I held the clicker slowed my response time. Second, I found it cumbersome trying to avoid dripping chicken juices onto our carpet. Day 2: Undaunted, I refined my training technique. Instead of using canned meat, I switched to deli meat that I could more easily grab. I also began using my left hand instead of my right to retrieve the meat. Both changes speeded up my delivery of incentives. But now I had a new challenge. Apparently, I’d trained two of my cats so well that they expected treats from my right hand, and they refused to believe that I might use my left hand. Day 5: After a few days of lackluster clicker training, I decided to consult my husband, who has trained our dog for almost ten years in agility. He asked three questions, all of which caused me to think. What command do you want to use? How do you want the cats to touch the target? We decided that I could stick with the command “Touch,” the cats should touch the target with their nose (not their head, cheek, or tail), and the first goal was for them to sit in an assigned spot. If I could achieve this goal, the cats would be less underfoot during meal preparation. Eventually, I could also modify this goal, so that the cats would retreat to their crate. After this goal is achieved, the next will be to send them to a crate in the case of an emergency. Clicker training could someday save their lives! After our discussion, Andy took on the role of handing out treats. In doing so, we figured out yet another way to refine my training technique. Instead of handing the meat to the cats to reward them, he placed the meat on the target. Now the cats would not just connect the clicker with a treat, but they’d also connect the target with a treat. The cats showed their appreciation with a flawless performance! Week 2: I moved on to the next step in targeting: changing the position of the target after each success. Each time my cats touched the stick, I clicked and treated. Initially, the higher or lower I moved the target, the more confused were the cats. Rainy even at one point rolled on the ground, as if looking cute would earn her a treat. With practice, I found it helped if I made sure that the cats were watching the stick as I moved it. Interestingly, two of them had no trouble following the stick when I moved it to the left or the right. Our third cat, however, made it clear that she wasn’t going to move far for a reward. For the rest of week two, I continued to change the position of the target after each success. The cats showed more and more focus, until near the end of the week when I moved our training session to a different time. Normally, we head to the basement right after lunch, but that day I had other commitments, and it was nearly suppertime before we started our session. Big mistake! Cinder’s tail twitched and she persistently meowed, while Rainy rubbed her head against me and purred. Neither of them could concentrate. Not even the juiciest meat could tantalize them. Their minds were firmly fixated on supper! Only Bootsie complied. 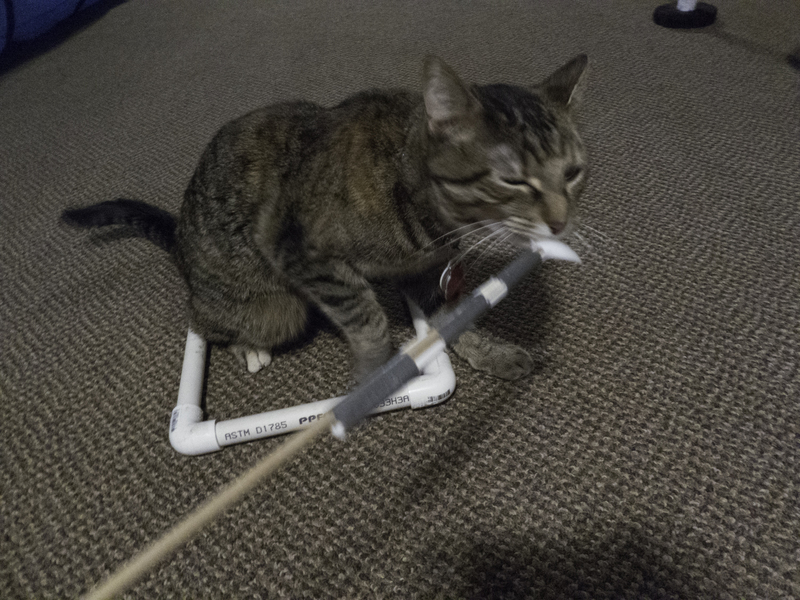 Week 3: I moved closer to my end goal, using the target stick to direct the cats to an assigned spot. As with previous attempts, the first attempts had a low success rate. Cinder twirled multiple times before she’d follow the target stick, while Rainy wandered this way and that before she’d follow the target stick. As we continued to practice, they began to dawdle less and moved to their assigned spot more quickly. In contrast, Bootsie became more reluctant. I was puzzled by her behavior. When I held the target stick in front of her, she’d gladly touch it with her nose and accept her reward. But when I moved the target stick to the left or right, which would require her to move to touch it, she stared at me as if that action would take too much effort. One reason for this might be that I can only reward her with prescription food, due to her food intolerance, and so she may not as highly motivated as the other two cats. On the other hand, if I forget to take the food with me when I leave the room I always find it gone upon my return, so obviously she likes it. Another factor could be her feral background. While she has adjusted to domestic life is many regards, she remains wary of new situations. Maybe the farther away I move the target, the more suspicious she is of trickery. One of the leaders in clicker training, Karen Pryor, has described clicker training as “a clear form of communication that combined with positive reinforcement is an effective, safe, and humane way to teach any animal any behavior that it is physically and mentally capable of doing.” After three weeks of clicker training, I’ve decided to take each cat at their own speed. With Cinder and Rainy, I’m mixing up their training by using the target stick to lure them through obstacles on an agility course, which is not only teaching them obedience but is also rewarding them with fun. As for Bootsie, I’m simply trying to get her to take one or two or three more steps to the left or right each day, with the realization that in doing so I’m building trust. And, ultimately, trust is the foundation for any training routine. Agility at home! Guests for a week! A breakthrough in a behavior problem! September was a month of upheaval for our family. It started with us buying and moving into our first house, and finally having space to set up an agility course at home. After that, my parents came to visit for a week, which provided all the pets with lots of socialization opportunities. Finally, seizing the opportunity to start anew, I tried once again to keep Rainy off the counter tops, and this time might have found a long-term solution. 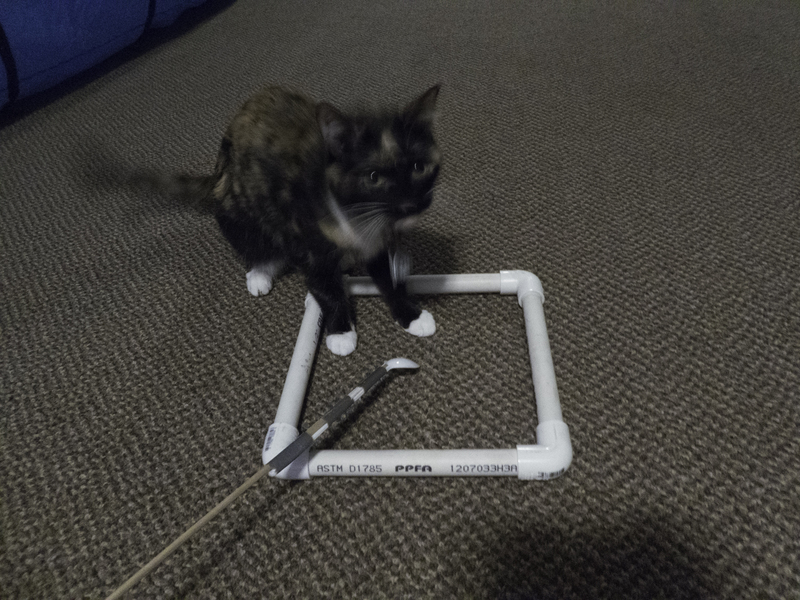 Back in February of this year, I wrote an article called Cat Agility, where I shared my attempts to replicate an obstacle course at home. At the time, the biggest hindrances were space and cost. Regarding space, I even posted questions to a Facebook agility group, asking members: “Where does everyone practice?” It turned out that I wasn’t alone. Others were doing agility in the hallway of their apartment building or in the living room. And we all were frustrated that we couldn’t leave our equipment up to use as time allowed. Hence, my excitement that I could reserve a portion of our new home’s finished basement for agility. At last, the pets and I could do agility whenever we want without the hassle of having to put up and take down a course. Moreover, I now can teach agility to even our shyest cat. As for cost, there are economical ways to build an agility course. As I noted in my Cat Agility article, I found a small affordable tunnel at Toys R Us. In addition, I bought two sets of weave poles and hoops for cats from Bed, Bath, & Beyond. Since writing my article, I also bought a foam jump through Lincoln Pet Exchange. Next purchases will be the supplies for an A-Frame and a pet walk! “Down!” “Get off!” “Leave it!” If you’ve ever yelled any of these commands at your pets, you’re not alone. Rainy is over two years old, and until recently nothing that we’ve tried has successfully kept her off our counters. First, we attempted the standard methods of using a spray bottle, double-sided tape on placemats, aluminum foil, and cans with coins in them. The idea behind all these contraptions was to make the counter unappealing, and indeed they’ve worked with other cats of ours. Unfortunately, none of these things have ever fazed Rainy. Next, we tried creative methods such as motion-activated deterrents. Andy found these scary rubber snakes that strike out when they detect movement. The first few times Rainy got “attacked” by these, she fled the kitchen. But the prospect of food encouraged her to persist, and soon she had learned how to stay out of the reach of the snakes. Then I tried an idea I got from a podcast. Just before preparing food I let Rainy down into the basement, where I let her explore until I had all the cat dishes filled. My latest idea has been the most successful. While I prepare the cats’ food, I have Rainy sit on a small stool next to me. Each time I open a new can, if she has kept her bottom on the stool, I let her lick food from my finger. This way, instead of simply restricting her access to food, I’m rewarding her good behavior. This idea has worked so well that as soon as I place the stool next to our kitchen countertop, Rainy jumps up on it and gives me her attention. With the arrival of October, life is more settled at the Frederick household, and I’ve finally resumed daily training with the pets. I’ve also begun a new kind of training, one that involves all the pets, and will introduce you to it in my next installment of Rainy’s adventures.